You can create this wonderful wooden snowman without freezing your fingers. 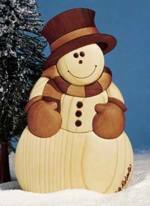 Our snowman comes alive with a warm smile and richly colored woods. Best of all, he will never melt away. This snowman was designed by Judy Gale Roberts. Plan includes wall-mounting instructions. You can use three different colors of wood or use stain to make your snowman come alive. We used white pine and two colors of red cedar and plywood (for the back), but you can use a wood of your choice. A full materials and supplies list is included with the plan. Scrollsaw, drill, drum sander or disc sander. Just received my plan, slow mail but can't wait to start. This aboriginal artwork appears in drawings belongs to North American native Indians, the Haida, found along the west coast of Canada, namely British Columbia. This North American native Indian art silhouette is a wonderful representation of actual totem poles that still exist on the west coast. This project can be complete with only 19 cuts.